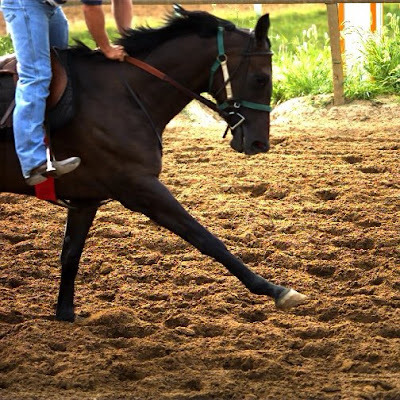 Fran Jurga`s Hoof Blog: News from Hoofcare + Lameness: Choose Your Racing Shoes: Last Days to Wear Toe Grabs Before 2009 Rule Changes! Isn't the "snow plow effect" shown in the photo caused when the foot lands toe first? Hello, and thanks for your inquiry. I don't know that that horse did land toe first, I think not. I have seen the clip in slow mo. You can see it, too, as it is now posted on the Courier-Journal web site. The snow plow effect, as I understand it, is the sliding motion of the foot after landing and, in particular, the little puff of footing that you can see on slow-mo footage. The criticism of artificial tracks is that the foot does not slide. Toe grab shoes are described in comparison with Queens plates in terms of relative "snow plow" effect. Perhaps I misunderstand the speakers at conferences, but that is what I have come to understand. Thanks Fran. Guess I'm more familiar with riding horses than racing way of going. Watching the slow motion of hooves on the track on another link you provided, I can now see where the foot lands true but the fast forward motion "plows" into the deep dirt surface to cause this instead of any toe first action. Thanks so much for furthering my education! 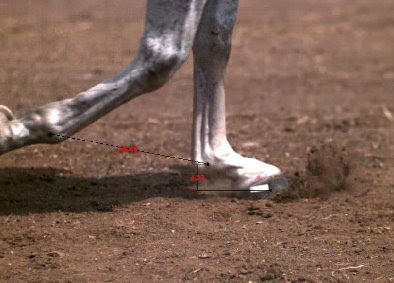 I agree with the first post, where the snow plow effect is most likely associated with the toe first landing (usually due to improper hoof shape/balance). In my experience on/off the track with thoroughbreds in the 2-4 yo age brackett, you can see this as they walk out. Most are not taught how to "come from behind" and work mostly off their front end as well which only makes the toe first landing more damaging. Toe grabs were adding insult to injury. Wonder how many more years will go by, young horses lost and excuses they will come up with before they finally decide that it's the hoof itself (and the conditions it-and the horse- are maintained in) that is causing all the breakdowns ;)HHmmmmmmm.